Born in Maidstone in 1845, Albert was the son of a builder and brother of Frank and Henry Goodwin (both of whom were artists). 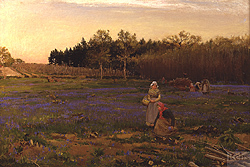 Not much is known of Albert’s early training, but in 1860 he exhibited his first work at the Royal Academy. In the early 1860s, as Allen Staley states in his book The Pre-Raphaelite Landscape, he was found as a boy of fifteen or sixteen attempting to paint from nature by Arthur Hughes, who invited him to come see his work. During the next few years he was to study under Hughes and Ford Maddox Brown, as well as given an introduction to John Ruskin (the writer, critic and artist who defended the Pre-Raphaelite movement). From 1870-72 he worked for Ruskin at Abingdon and Hinksey, and was elected an Associated of the Royal Watercolour Society (becoming a full member in 1881). In 1872 he accompanied Ruskin on his travels through Italy and was employed to copy objects. 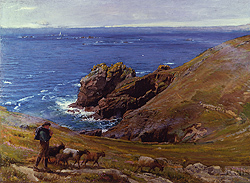 Goodwin was mainly known for his majestic landscapes, coastal scenes and imaginative subjects which show a deep concern for the effects of light and atmosphere. His early exposure to the techniques and ideas of the Pre-Raphaelite would influence him throughout his career and as late as 1918 he states, in his diary, that: I owe so much to Arthur Hughes and Ruskin, that it has been difficult and hard to unlearn that which I got also from them. In the same year, for the 1918 Royal Academy exhibit, he finished two works in less than two weeks and wrote: How ashamed the Pre-Raphaelites would be of work done in so short a time. In the early 20th century he held a number of one-man shows, including one at the Birmingham Art Gallery in 1926. He was also a frequent exhibitor at many of the major exhibition halls in England between 1860 and 1932. Today examples of his work can be found the Aberdeen Art gallery; Blackburn Art gallery; City Art Gallery, Manchester; Ulster Museum; Portsmouth City Museum; Maidstone Museum; and the Tate Gallery, London.